Is this dress appropriate for an office Xmas party? Got it at Bluefly. I think I made my friend marriage obsessed. I seem to spend all day planning and talking about my future wedding. But I know I'm not ready to get married yet, what is up with that? I think I just want a big party where I'm the star!... with my partner of course. There are so many different styles by this designer - pencil, strapless, drop waist. I think I'm gonna have all my girls wear different dresses in the same color. How fun would that be? I think A LOT! I don't know why I have much fun planning my wedding, maybe I should have done it professionally. Hmmm, anyone know how to break into the wedding planning business? While his win on the first episode showed a lot of promise, I wasn't very into Emilio's collection, entitled "Color Me Bad." The brightness seemed almost garish. Alas, this is when the cameraman in my aisle started to really move around, so the quality of my pictures really deteriorates... blast him! 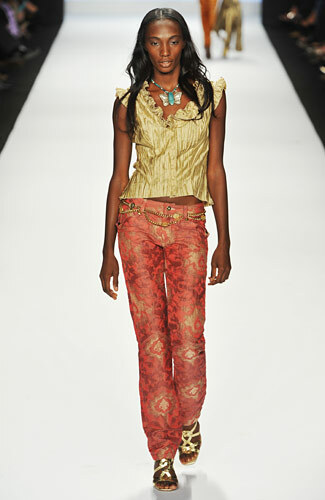 Jonathon's collection was all about flying, taking inspiration from both birds and insects. Some of the pieces really excited me, but some looked a bit on the, dare I say, cheap side? Janeane's collection was inspired by things that aren't alive, but still know how to grow, such as crystals. I felt like it was pretty wearable, but didn't stand out very much, with the exception of a cocktail frock with embellished shoulders. I liked the blue though! Jay is without doubt my new favorite!!! I was really blown away with his edgy, slightly futuristic collection. I loved the detailing, and the tough chick look! If he's not a finalist, I will be sad, because his work was really amazing. Ben was inspired by Ray Bradbury's "The Martian Chronicles." I was a little unsure about the wacky colors and looks at first, but I really think I love it! Interesting, but maybe too conceptual to be a winner? I do really like the bright blue tights and cut out knees! Anthony's collection was all about keeping a positive outlook, even during these rough economic times. 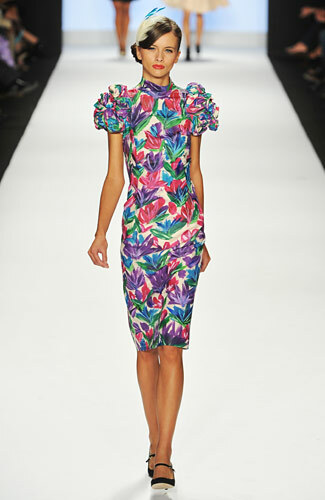 There were a lot of cute bright colors and ruffles, but it didn't feel terribly sophisticated to me. I would guess he's not a finalist, what do YOU think?? Suede started off so strong, but since then Suede really hasn't impressed Vyqué. Vyqué feels like Suede is trying too hard in this collection and wonders if it was designed for a princess-obsessed five-year-old. Throwing in a random boring piece does not make your collection less over the top hideous! This is ok, but the weaving on the bust makes her look super top heavy! This just looks poorly made. The woven top is interesting, but the skirt is way too Tinkerbell! Korto has always been super talented, but she never smiles, even when she's getting tons of compliments from the judges! Come'n girl, you're showing the world what you can do, flash us your pearly whites. Her collection reminds me a bit of Uli's - maybe it's the colors which feel kinda Miami to me. Feel free to let me know I've gone crazy! Very pretty, but I need more wow factor. Almost too much volume but this jacket is pulled off, mad props! Ooo, very pretty, love that pleated front. This color is fabulous, but I'm a little confused by the sleeves - they look deflated. This is beautiful, but I wish the model wasn't holding the front! Also, I kinda wish it was in that bold green! Is that a cowl neck? Love the top on this dress! Not sure if I like the asymmetrical straps. I would really like this if the skirt wasn't lined with stripes on the inside. I feel like the Asian print should be the focus too much going on! 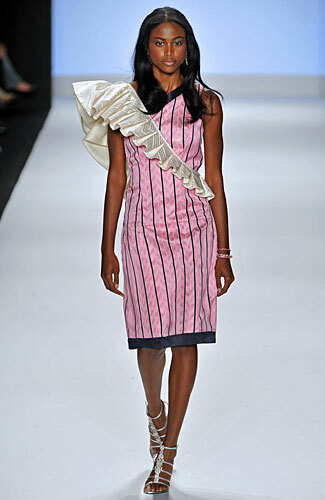 Here's more of her Viktor & Rolf / Balenciaga shoulders. Very similar to one of her previous designs... show us something new! Well I didn't expect this from Kenley, which is appreciated. I totally adore this dress, something I would buy in a heartbeat! Here's Joe's collection, which has a very Western cowgirl feel to it. It got a lot of criticism, but, while I'm not really into the country style, I thought it was decent and very wearable. It was mostly cohesive with the exception of the star dress and the leather top with garnet red skirt. This top has nice detailing. I can't tell, are these pants sheer? I actually really like this outfit, a mix of Chanel prim blazer and rock leather pants = perfection! 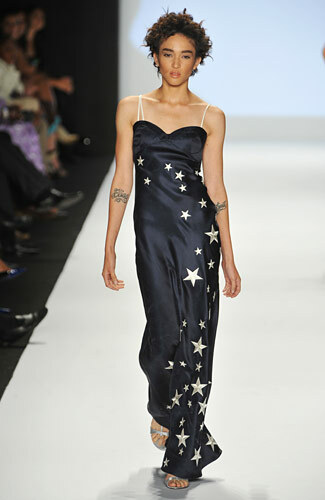 I really like this dress too, but I can never resist stars! Kinda goth compared to the rest of the collection. My favorite has always been Leanne, and this collection demonstrates her mad pleating skills. But I think I was hoping for something a little more? I would totally wear this outfit! This is a fun skirt, but not really wearable in real life, don't you think? I kinda wish this jacket had a regular cut from the bust down! This is really pretty and I want it! Very Leanne, but again bit much for real life. Kinda boring for the last piece shown.